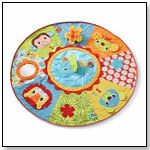 A giant size 47" diameter round play mat with plenty of room for baby to crawl and play. It has a detachable mirror, teethers, and eye catching polka-dotted fabrics and many interesting textures. There are big satin patches, and crinkle ears on big faces of a monkey, mouse, bear, and elephant. A colorful lion’s mane has a velour feel and bright yellow face.